Dun-dun-dun-dun--dun-dun-dah!! 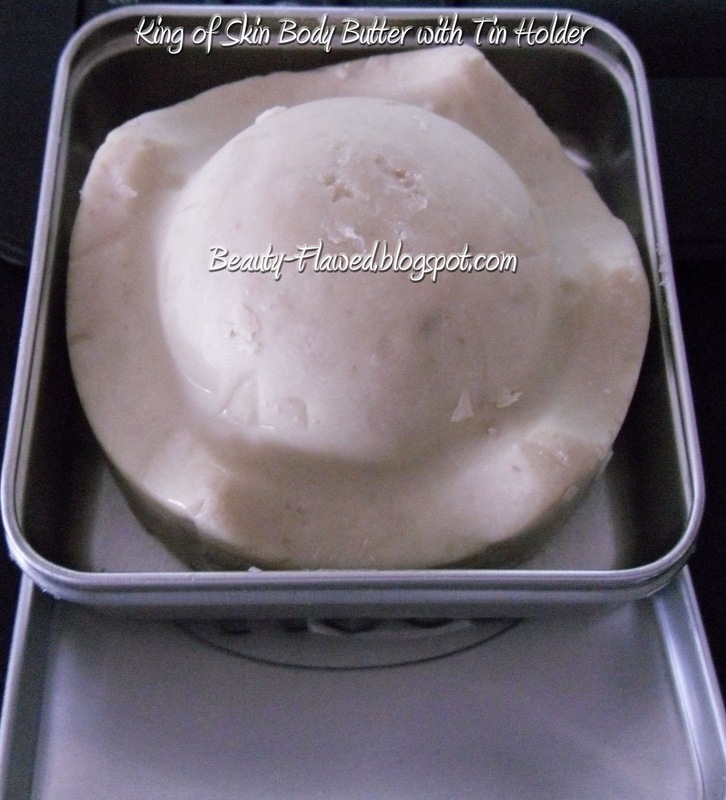 King of Skin is a super moisturizer body butter that can be used in the shower or bath. It sort of reminds me of those in shower lotions that came out a while ago but without the mess they created. Its a handy little size and melts when you get to rubbing it on your skin turning whats on your skin into this soft moisturizing oil. I like to use mine in the shower after I've cleansed. I have noticed that it does get quite slippery when rubbing it all over and can be hard to hold onto if your not careful and it can also make the floor of your shower slippery so use with caution! This bar is great for people with really dry skin its packed with calming and softening ingredients like Cocoa butter, Shea butter, Coconut butter, Oat milk, and Banana for extra soft skin. I have really dry skin and usually use Eucerin in my daily routine on days I use this I don't have to use Eucerin because it is that moisturizing. You'll notice a difference in your skin almost immediately after using and it works great on tattoo's makes mine look like I just got them done. A lot of reviews say that this product is greasy and I do have to agree with that for the most part however, I feel its only greasy at first before you really get it rubbed in. I suggest applying it all over then rubbing it really really good, if you don't like the way your skin feels after rubbing it in take a quick rinse in the shower and you'll be good to go. Now onto the scent of this product, I can't really place what it smells like to be honest. Its not a bad smell but I don't particularly care for it either. Luckily it fades once its been on the skin for a short while, so I can live with it. I think I would be happier with it if it smelled of coconuts or maybe more of a banana smell, or really anything other than the blah scent it has now. It is also a little on the pricey side ($13.95 for 3.3oz) you should probably get 10+ applications with this for full body more if your just using it on your legs. I picked up the Body Butter Tin for $3.95 for it as well, it fits really nice inside it and helps keep it from becoming messy from leaving it out. Overall I really like King of Skin and I would buy it again even tho I don't really like its BLAH scent. If you have super dry skin give it a try it could be the answer to stop the itching!